I just need the second book now! I’m counting down the days, at least I will only have to wait a month. I forgot how compelling Ker Dukey’s writing could be. And after recently being introduced to K Webster’s too, I am officially a fan of both. They did so well together. I always imagine writing a book with another author to be difficult, how does it even work? It also doesn’t always work to the best advantage but these two nailed it. It was perfection. I loved the mystery surrounding the story. 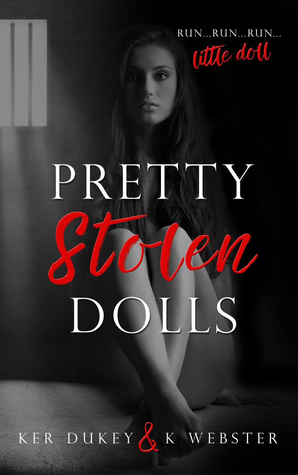 I initially thought it would be as any other captive story is about Jade’s time within the cell. But it mainly focused on her time afterwards. It provided a unique turn and also it was more interesting than someone just planning an escape throughout the book. I think mystery and crime might be my new thing! There is definitely romance in this book but it’s not the sole focus and again I loved that. There’s a sicko out there who’s playing mind games with Jade and who needs to be put captured and taught a lesson. I honestly had Dexter in my head while reading this. I managed to pick up a few things from watching the show about homicide etc. It worked to it’s advantage as I think I liked it even more because of that. This is a book you must read if you are a fan of suspense. It’s a story which will have you compelled from beginning to end. The writing is alluring and the characters are interesting. I hope Benny get’s what he deserves. Torture like he has been giving to innocent girls over the years. I’ll end with a quote. Perfect is in the eye of the beholder, Jade. In the right person’s eyes, you’re all kinds of perfect.